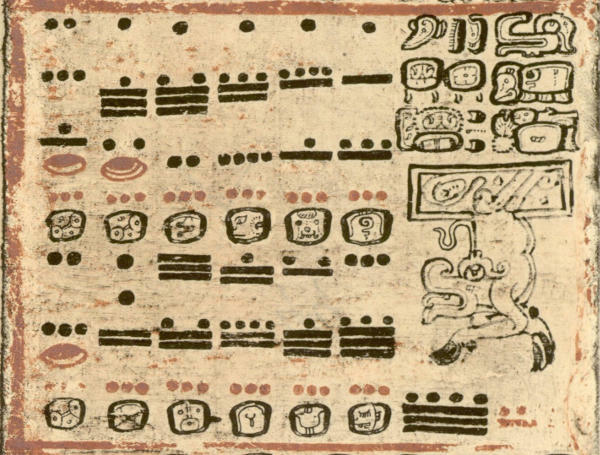 Ancient Maya arithmetic and numeration system, with its Dot-and-Bar notation and concept of zero, is a fascinating topic. In this article, we will explain how to read the Maya numerals and how to do mathematical operations in the Maya vigesimal system. This resource can be use for the History Key Stage 2 (KS2) curriculum. NB: specialists of the Maya civilisation say “Maya numerals”, “Maya number system”, “Maya mathematics” and not “Mayan numerals” etc. The adjective “Mayan” is used only in reference to languages (see: 10 red-flags for spotting unreliable online resources). The Maya were advanced mathematicians. Their numerical system, possibly one of the world most advanced at the time, allowed the Maya to do the elaborate calculations needed to make precise astronomical predictions and the precision of their observations along with their astronomical and calendrical recordkeeping were astonishingly accurate. It now appears that the Maya had begun to use a system of numeration by position as early as the Late Preclassic (ca 400 BC-150 AD). Also called place-value notation, a positional notation is a system for representation of numbers -like our own- in which the value of a numeral symbol depends on its position (e.g. the “ones place”, “tens place”, “hundreds place”). One of the great intellectual accomplishment of the Maya was the use of the mathematical concept of zero. They were one of the only ancient civilisations to use it (the great Egyptians never used the concept of zero!) and the appearance of the zero in Maya inscriptions is one of the earliest known instance of this concept in the world. Contrary to popular belief, due to geographical disconnect before the Conquest, Maya and Mesoamerican never had any influence on -and reciprocally, had not been influenced by- Old World mathematics. In their numeral system, the ancient Maya only used three symbols to represent all numbers. A dot has a numerical value of 1, a line (or bar) a numerical value of 5 and a shell has the value of “completion” or 0. That’s the Dot-and-Bar notation used all over Mesoamerica. These symbols (dot, bar and shell) are thought to represent items that the Maya people might have first used to count with, such as: pebbles, sticks and shells. So where we learn to count on our fingers, Maya children counted on their fingers and toes. The numbers above nineteen are indicated on the basis of their vertical position. 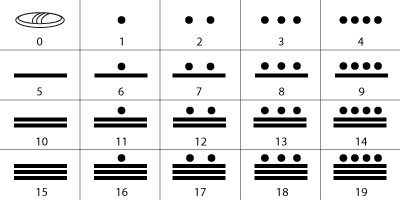 The Maya used a vigesimal (Base-20) system, so each position is a power of twenty. Our own Hindu-Arabic numeral system uses powers of tens (“ones place”, “tens place”, “hundreds place”); it’s a decimal or Base-10 system. The ancient Maya used a vigesimal (Base-20) notation in which each position is a power of twenty (instead of ten as in our decimal system). In a Base-10 system, there are 9 digits (1,2,3,4,5,6,7,8,9) plus a zero. When writing numbers, once we get to ‘9’ we then have to move across to the next column. We write a ‘one’ followed by a ‘zero’ to show that we have moved across. Zero is a ‘place-holder’. From there, we’re going to use the 9 numerals to represent the number we want up to 99. Then, when we go beyond ’99’, we move across to the next column and write ‘100’. The Maya used a similar system using their 19 numerals and then moving to the next section and putting a zero (represented by the shell) as a placeholder. Another difference is that the Maya used rows instead of columns, starting from the bottom and working upwards. So the place values were multiples of 20s: 1s, 20s (20 x 1), 400s, (20 x 20), 8,000s (20 x 400) and so on. The Maya vigesimal system is every bit as useful and efficient as our own decimal-place system. Besides being base 20 instead of base 10, it differs from ours in using combinations of just three symbols (shell, bar, dot) whereas we have to use 10 different symbols (0, 1, 2, 3, 4, 5, 6, 7, 8, 9). How did we get there: we know that 4285 is smaller than 8000 (20³) so we’re going to divide it by 400 (20²) which gives us ’10’. The remainder is 285 which we’re going to divide by 20 (20¹). That gives us ’14’ plus ‘5’ units left over. Adding and subtracting numbers using the Maya numeral system is very simple. Addition is performed by combining the numeric symbols at each level. Similarly with subtraction, simply remove the elements. Smithsonian National Museum of the American Indian– Pupils can take the Maya Maths Challenge where they are asked to calculate numbers in the Maya number system. The game has varying levels of difficulty. 9 Responses to "Maya Numerals & Mathematics"
Thank you for your comments – a lot of work goes into creating these resources for children/teachers/general public, so comments such as yours are greatly appreciated! Thank you – i’m glad!